Louis Riel a Hero or traitor. History of Louis Riel and his rebellion. Louis Riel leaded and started the North-west rebellion; b.22 Oct. in the red river settlement (1).While the rebellion was progressing Louis Riel who was well known by the Metis which gave him the upper hand in gaining an influence over Metis community to change the government unfairness against the natives/metis(2). In 1849 he organized the community to aid Pierre-Guillaume (Sayer*), a Metis charged with violating the Hudson’s Bay Company’s trade monopoly (3). Louis Riel is now considered one of the founders of Manitoba. The North-west rebellion was a long and violent conflict between the Canadian government and the metis along with some of their aboriginal allies. The North-west rebellion was after, Louis Riel proposed a provisional government in 1869, November 23rd and bill of rights/petition (4). Louis Riel’s bill of rights/petition for provisional government was accepted and in 1869, December 8th(5). Most of the metis/aboriginal tribes started to enter starvation because their main food source “bison” started missing and becoming harder to find(6). Most of their land had been signed away in treaties with the canadian government, so they couldn’t do anything to retrieve their land or valuable resources(7). Most of the wild secret of their land had now been in colonization by the canadian government(8). Most of their hunting grounds were inaccessible because of fences/train tracks, towns and canadian forces security.Without Louis Riel there would have been no manitoba which would have caused another chain of events leading to chaotic outcomes, because peace was in the escence of the war. Battle of fish creek, 800 canadian officers deployed against 150 metis and native allies in 1885(9). 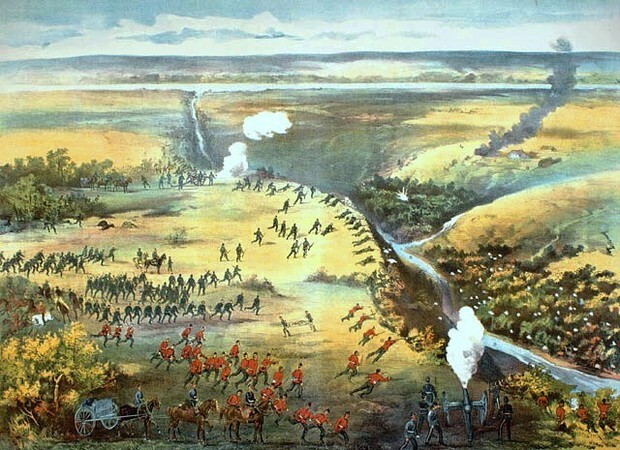 The battle of fish creek was in the favour of the canadian government, more manpower and better vantage point on the terrain which gave them the opportunity to use heavy cannons.The 5-month endless battle was the only way for the metis to have a chance at being reinstated with their land and all assets. When the metis created another bill of rights it was either accepted or war, But the canadian government declined starting a gruissem war. What makes him a hero. Dr.John Christian shults did not appreciate Louis Riel's red river resistance and decided to create an opposition to take out the red river resistance, And take back control of Fort Gary(11). When Shults was leading the assault Louis Riel captured a division of his assault because of that Schultz retracted his attack force(12). Louis Riel gained the upper-hand than Shults led a secondary assault and most off his militia was captured, Louis Riel's rebellion was supposed to result in peace, When Shults force was captured a man named Thomas Scott was trashing the guards and then was brutally killed(13). People prior to the event claimed Louis Riel killed him in militias act of violence(14). He was executed by a Metis firing squad in the courtyard of fort Gary(15). Although Thomas Scott was killed by the hands of Louis Riel's men was it wrong and should he have been tried for treason and executed. Shults and his militia were acting on racism towards the aboriginal/native and Metis people. Maybe Thomas Scott's death was for the greater good. Dr.John Christian Shults and his militia should have been charged with violation of Louis Riel's bill of rights provisional government. The Hudson Bay Company started to sell the metis land and assets again and Louis Riel was called back to duty to create another bill of rights like he did before(16). Louis Riel Started the rebellion but made sure all of his troops would not shed any blood and made it clear because he wanted the rebellion to be peaceful so that the Canadian government would consider his bill of rights(17). He Persuaded McDonald who was high in control to accept his provisional government(18). He gave the metis a fighting chance and gave them the courage to stand for what they believed in. When he proposed his second bill of rights McDonald refused because he already had what he wanted, he wasn't concerned of war because the metis where greatly outnumbered compared to McDonald's infantry(19). If Louis Riel wasn't the leader of the north west rebellion someone else who had the same concern would have started and led the north west rebellion but would not have handled the steps taken non-violent. On July, 6, 1885 the Canadian government laid a formal charge of treason against Louis Riel and was held trial(19). Punishment of high treason is execution by hanging or firing squad. Louis Riel was hanged, but was he the one who should have been hanged ?. Louis Riel heritage moment explains his thoughts prior to the execution/on the day of execution(20). The Canadian government killed the founder of Manitoba. The railways might have not even been built if Louis Riel didn't lead a peaceful rebellion. When Louis Riel came to McDonald with the second bill of rights McDonald denied starting an inevitable war that wasn't necessary. He started the war and denied the second bill of rights because he had the resources to win the war, in fact he knew there wasn't a possibility of him loosing at all. Thomas Scott didn't die by the hands of Louis Riel but by the hands of a metis fire squad(21). Thomas Scott was part of a racist uprising of Louis Riel's rebellion they hated the metis and lead an assault on fort Garry which was controlled by Louis Riel twice(22). Thomas Scott was captured in the second assault from Shults even though Shults had a major loss of infantry he still led the second assault, inevitably causing more losses/casualties on his side(23). Thomas Scott was executed in the courtyard of fort Garry because he was deliberately directing racist comments and gestures to metis guards and was insulting Louis Riel(24). Since Louis Riel was part french people from recently french occupied provinces were morning the execution of Louis Riel, And now have a national celebrated holiday called "Louis Riel day"(25). At the time of Louis Riel's execution the Canadian government was still unfair towards the metis civil rights, maybe Louis Riel's trial was influenced by racism and hate towards him and his rebellion. Weather or not Louis Riel is a hero or traitor is a discussion based on opinion and substantial evidence. After reviewing his past life and the death of Thomas Scott Louis Riel is a hero and the execution and trial was questionable. The Canadian government was corrupt by racism and hate for the metis and McDonald was the one who wanted violence and war not Louis Riel/Metis. (1),(2),(3), Thomas, Lewis H. "Biography – RIEL, LOUIS (1844-85) – Volume XI (1881-1890) – Dictionary of Canadian Biography." Biography – RIEL, LOUIS (1844-85) – Volume XI (1881-1890) – Dictionary of Canadian Biography. University of Toronto, 1982. Web. 25 Apr. 2015. <http://www.biographi.ca/en/bio.php?id_nbr=5796>. (4),(5), "Life Events." Province of Manitoba. N.p., n.d. Web. 25 Apr. 2015. <http://www.gov.mb.ca/february_holiday/chronology.html>. (6),(7),(8),(9) Beal, Bob, and Rod Macleod. "North-West Rebellion." The Canadian Encyclopedia. N.p., 07 Feb. 2006. Web. 25 Apr. 2015. <http://www.thecanadianencyclopedia.ca/en/article/north-west-rebellion/>. (10),"History of Canada." Wikipedia. Wikimedia Foundation, n.d. Web. 25 Apr. 2015. <http://en.wikipedia.org/wiki/History_of_Canada>.